MYSY Mukhyamantri Yuva Swawlamban Yojna, mysy.guj.nic.in, MYSY: The Government of Gujarat recently announced its new scheme for all students names as Mukhyamantri Yuva Swawlamban Yojna know as MYSY. 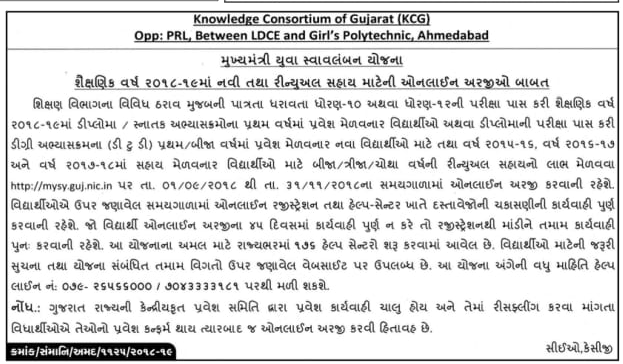 Eligible and aspirant students may visit mysy.guj.nic.in- Mukhyamantri Yuva Swawlamban Yojna. The scheme has been implemented in the academic year 2016–17. The MYSY scheme offers scholarship for students and age limit relaxation for government jobs for Economically Weaker Section (EWS). Students may get benefits by visiting MYSY official website. Economically Weaker Section (EWS) weaker families may get benefits in primary, secondary, higher secondary & diploma-bachelor education. The online applications for the scheme are invited through the official website of MYSY Gujarat at mysy.guj.nic.in. Mukyamantri Yuva Swavalamban Yojana online registrations done by the 10th, 12th and diploma/graduate students to avail the scholarship. Under the MYSY, the state government would provide financial assistance to the eligible meritorious students in the form of scholarship. The scheme will be implement in current academic year. Gujarat government is going to spend Rs 1,000 crore per year. The students who can get more than 80 percentile in 10th or 12th science/arts and want to get admission in diploma or bachelor degree. The Students who get more than 65% in diploma and want to gate admission in bachelor degree. Parents annual income not more than Rs.6,00,000/- those students may get benefits of MYSY Scheme. Children of Shahid jawans. Students have show document verify by Director of Soldier Welfare Board. For Diploma Course: Student must have secured 80 or more Percentile in 10th and family income must be less than Rs. 6 lakh/annum. For Engineering and Pharmacy Course: Student must have secured 80 or more Percentile in 12th Science and family income must be less than Rs. 6 lakh/annum. For Medical Course: Student must have secured 80 or more Percentile in 12th Science and family income must be less than Rs. 6 lakh/annum. For Other Course (BCom, BSc, BA, BCA, BBA): Student must have secured 80 or more Percentile in 12th and family income must be less than Rs. 6 lakh/annum. Applicant have to go on its official website mysy.guj.nic.in. Click on the “New Application” on the top right of the website homepage. For new registration, click the link “If you have not registered plz. click for Registration” or If you are already registered, login by filling the required details and password. Enter the necessary information and submit it. You will get the password for login, use this password to login to your account. Fill necessary information like personal information, address, education information, family income, bank detail etc. Once the registration is complete, you will get a MYSY reference/registration number which can later be used to check the status of MYSY application. If you have any query regarding Mukyamantri Yuva Swavalamban Yojana MYSY Scholarship Scheme, don’t hesitate to share with us. Leave your Comments/ query in the comment box given below. We will try to assist you.